Background: The aim of this study is to verify the variations of the temperature inside the root canal with three different gutta-percha heating systems. Materials and Methods: A split-tooth model was built with a lateral groove at 3.5-mm from working length (WL) in order to insert a Chromel-Alumel K-type thermocouple placed in contact with gutta-percha. The thermocouple was connected to a digital thermometer. Sixty obturations were made with medium gutta-percha points. For 20 specimens the System B was used with the Buchanan fine plugger and the temperature was set at 200°C; for other 20 specimens the Endo-Twinn with a fine plugger was used and for the last 20 specimens we used the E-Fill with a 40.04 plugger. All pluggers were pushed to 3.5 mm from WL so that the tips were in contact to the probe. Results: The analysis of 60 samples showed the highest temperature average using the System B after 10 seconds (86.85°C), after 15 seconds (94.9°C), after 20 seconds (100.4°C) and after 25 seconds (104.5°C). The Endo-Twinn average values are similar to System-B ones. The E-Fill average values are lower (69.9°C) than the other two systems evaluated only after 10 seconds due to limited working time. The temperatures average obtained using different systems of warm vertical compaction are lower than what was declared by the producing companies. Conclusion: Time is one the most important parameters to consider using these systems. Temperatures reached from the System B and Endo-Twinn after 25 seconds; however, seem to be sufficient to ensure an optimal adaptation of the gutta-percha in the anatomical complexity of root canals. The temperatures obtained from the E-Fill, only after 10 seconds, instead seems to be insufficient to assure the rheological characteristics of gutta-percha. The primary goal of endodontic treatment is to fill and seal the root canal system after proper cleaning and shaping. An inadequate apex sealing and an incomplete filling root canal system may be responsible for the post-treatment failure. , The warm vertical condensation technique, introduced by Schilder in 1969, widely described, is based on use of a heat source (temperature between 170°C and 220°C) to soften the gutta-percha; also we need a cold plugger in order to obtain the vertical compaction. However, the gutta-percha is not an excellent heat conductor. When heated, it changes the physical characteristics for no more than 3-4 mm, as demonstrated by different studies. ,, There was a significant change of method with the introduction of System B: A source of heat which is a plugger, able to run simultaneously heating and compaction of gutta-percha by the continuous wave of condensation technique proposed by Buchanan. The advantage of this method is the simultaneity of two phases, with one wave of condensation. The proprieties of the alloy used to produce the plugger have allowed to bend it for a better filling in curved canals. For System B, however, the physical property of gutta-percha needs temperatures close to 200°C and the plugger has to be pushed at 5 mm from the work length. ,, Recently, a new device has been introduced: It is the Endo-Twinn, which is similar to System B plus a vibration source. ,, Also an other recent device, called E-Fill, has been put in the market that is similar to System B but it runs just for 10 seconds. The purpose of this study was to measure the temperatures inside the canal, depending on the time, using the System B, the Endo-Twinn and the E-Fill. A maxillary canine with a straight, single canal was used to produce a single split-tooth model. , The tooth was inserted in acrylic resin (ETI, Fields Landing, CA) that cured for 24 h. A trimmer was used to square the sides of the block of resin and then it was polished by a rag wheel and polishing compound. A drill press was used to drill four holes through the block to a buccal-lingual direction, (two on the mesial side and two on the distal side). The tooth was then divided by a cut through the centre of the canal with an Isomet saw (Isomet™ Law Speed Saw, Buehler® . Blade thickness: 0.15 mm) so we had two halves (buccal and lingual). The crown was then removed, the total root length was 24 mm and WL was established at 1 mm from the anatomic apex. The two halves were repositioned by four bolts that fit tightly in the holes drilled before. The canal was reamed with NiTi rotary instruments (MTwo files) used with a 16:1 gear reduction hand piece (E-GO endodontic system, Sweden and Martina® ) and as solution for irrigating RC Prep lubrication and 0.5% sodium hypochlorite were used. The sequence used was up to 25.06# and the WL reference point was established at 23 mm. A lateral groove was made at 3,5 mm from WL in the canal with a 0.15-mm kerf Isomet saw blade in order to place a Chromel-Alumel K-type thermocouple. The thermocouple was placed in the grove so it could touch the GP. The thermocouple was connected to a digital thermometer NR-1000 (range: −200°C and +1300°C, estimated error: 0.05%; Keyence, Osaka, Japan). The digital thermometer was connected to a computer and set to record the temperature at 0.5-second intervals using Wave Thermo 1000 software (Keyence) [Figure 1]. The tooth model was stored in an incubator that was set at 37°C and it was removed only during obturation of the canal. During each obturation, the apical two-thirds of the tooth model was kept submerged in water at 37°C. A scale was used during vertical compaction to control the condensation force, which never exceeded 2.5 kg, in order to simulate the clinical conditions as much as possible. All specimens were divided in three groups (A-B-C) of 20 teeth and all obturations were performed for each experimental group by using medium size gutta-percha cones (Mynol; Sure Dent Corp., Seoul, Korea). For group A was used System B (Sybrondental, Orange, CA, USA), setting 200°C, using a Fine Plugger at 3,5 mm from WL. For group B was used Endo-Twinn (Endo Twinn B.V., Amsterdam, The Netherlands) using the Plugger F (Endo Twinn B.V., declared temperature 200°C) at 3.5 mm from WL. ,, In group C the E-Fill was used following the same procedures as the System B and Endo-Twinn so a 40.04 plugger was placed at 3.5 mm from WL setting the temperature at T6 (declared temperature 200°C). In all three groups the tip was in contact with the probe. After each obturation, the model cooled for 5 minutes. The temperatures reached were recorded every 10, 15, 20 and 25 seconds. In all groups, on purpose, was not used the sealer because it might have distorted the results. The statistical analysis was done using the test ANOVA F Fischer, that test measures ANOVA repeated with the variable indicator of treatment used as a predictor categorical and test post-hoc. The results of post-hoc tests showed that the average temperature after 10 seconds of the System B (86.9°C) is significantly greater (P=0044) than the average temperature of the Endo-Twinn (85°C) and significantly higher (P<0001) than the average of E-Fill (69.6°C). The average temperature after 10 second of Endo-Twinn (85°C) is significantly greater (P<0001) than the average of E-Fill (69.6°C). Due to the limitation it was possible to record the E-Fill temperatures only after 10 seconds because it works for a limited time. The E-Fill results showed lower average (69.9°C) compared to the other two systems after 10 seconds. Comparing System B and Endo-Twinn, (both work for over 10 seconds) the System B plugger had a temperature (average 99.9°C) significantly greater (P=0.000212) than the temperature of Endo-Twinn plugger (average 96.9°C). The analysis of results showed that the temperature tends to rise significantly (P<0.000001) along the various steps regardless of the time (after 15 sec=93.1°C, after 20 sec=99.1°C, 103.2, after 25 sec=103.2°C). The significance of the interaction Time-Tip Temperature (P=0032) showed a statistically significant increase and this significance may be traceable to a greater temperature difference between 15 sec and 20 sec in System B compared to that observed between two same time step for Endo-Twinn. In conclusion System B presents temperatures significantly greater than Endo-Twinn in every step [Table 1]. Use of gutta-percha heaters inside the root canal system has become increasingly popular in endodontics. In this study we have been verified the true temperatures, developed by three different systems for canal obturation inside the root canal during the warm vertical compaction technique. Studies suggested that the working temperature for devices used for warm vertical compaction techniques, using the smallest tip at a distance of 5-7 mm from the apex, should be about 185°C. Others studies furthermore have revealed that the temperatures read on the displays were often inaccurate and higher than the real temperatures measured at the tip. Venturi et al. has demonstrated that, setting the System B Heat Source at the temperature of 250°C on the display, the highest temperature recorded was 160°C at 2 mm from the tip. In this study, the temperatures reached using the System B and Endo-Twinn after 25 seconds are still sufficient to ensure an optimal adaptation of the material filling to the complexity morphological of canals. Temperatures obtained by E-fill, that runs no more than 10 seconds, seem to be insufficient to develop the rheological gutta-percha characteristics. At the same time, an increase of 10°C in periradicular tissues is considered to be dangerous, ,,,,, even if bone necrosis was found only after maintaining a constant temperature of 44-47°C for at least 1 minute. Root canal obturation with thermo-plasticised gutta-percha has also raised concern over the injection of highly heated material into the root canal system. This technique also has the potential for excessive heat in the canal that can produce cellular damage in the adjacent tissues. , The risk of a potential damage for cells around the root suggests to be careful when a heating carrier is inside the root even if some studies show that the real temperature on the root surface may be less in vivo than in vitro thanks the presence of the periodontal ligament. An intact vascular net in the area and the thermal conductivity of the periodontal membrane and the alveolar bone could dissipate the heat that rises on the root surface. Also we should consider that the time needed to get the working temperatures, (especially if it is not close to 200°C), in order to develop the rheological characteristics of gutta-percha might create damages to periodontal cells so further uncertainties regarding the long-term effects of this form of treatment have arisen. Concluding choosing and knowing the temperature reached inside the canal seem to be very important moreover a compromise is necessary between the temperature that allows the gutta-percha to melt properly and the need to avoid damages. So a better understanding of the currently used endodontic heating systems should be adopted to ensure good quality fillings, then an assessment of the variation in temperature on root vital cells is necessary, in order to evaluate the influence of such systems on periodontal tissue depending also on the time of application of heat. All devices clinically used to warm up gutta-percha inside the root should have a precise display that allowed the dentist to be aware of the true temperature reached in the canal during the warm condensation in order to avoid an insufficient warm up of the gutta-percha or an excess of temperature that may cause a damage in the vital tissues around the root and irreversible molecular modifications of the root filling material. 1. Schilder H. Filling root canals in three dimensions. Dent Clin North Am 1967;11:723-44. 2. Petersson K, Petersson A, Olsson B, Hakansson J, Wennberg A. Technical quality of root fillings in an adult Swedish population. Endod Dent Traumatol 1986;2:99-102. 3. Hoen MM, Pink FE. Contemporary endodontic retreatments: An analysis based on clinical treatments findings. J Endod 2002;28:834-6. 4. Cohen BD, Combe ED, Lilley JD. Effect of thermal placement techniques on some physical properties of gutta-percha. Int Endod J 1992;6:292-6. 5. Schilder H, Goodman A, Aldrich W. The Thermomechanical properties of gutta-percha. A thermic profile of warm gutta-percha packing procedure. Part IV. Oral Surg Oral Med Oral Pathol 1981;51:544-51. 6. Gurney BF, Gervasio G, Best EJ. Physical measurements on gutta-percha. Oral Surg Oral Med Oral Pathol 1971;32:260-70. 7. Marciano J, Michailesco PM. Dental gutta-percha: Chemical composition, X-ray identification, enthalpic studies and clinical implications. J Endod 1989;4:149-53. 8. Blum JY, Parahy E, Machtou P. Warm vertical compaction sequences in relation to gutta-percha temperature. J Endod 1997;23:307-11. 9. Marciano J, Michailesco PM, Charlot C, Rambaud J. Gutta-percha cones: Chemical composition, X-ray analysis. J Odontol Conserv 1989;9:3-11. 10. Buchanan LS. The continuous wave of obturation technique: 'Centered' condensation of warm gutta percha in 12 seconds. Dent Today 1996;1:60-2. 11. Kulild J, Lee C, Dryden J, Collins J, Feil P. A comparison of 5 gutta-percha obturation techniques to replicate canal defects. Oral Surg Oral Med Oral Pathol Oral Radiol Endod 2007;1:28-32. 12. 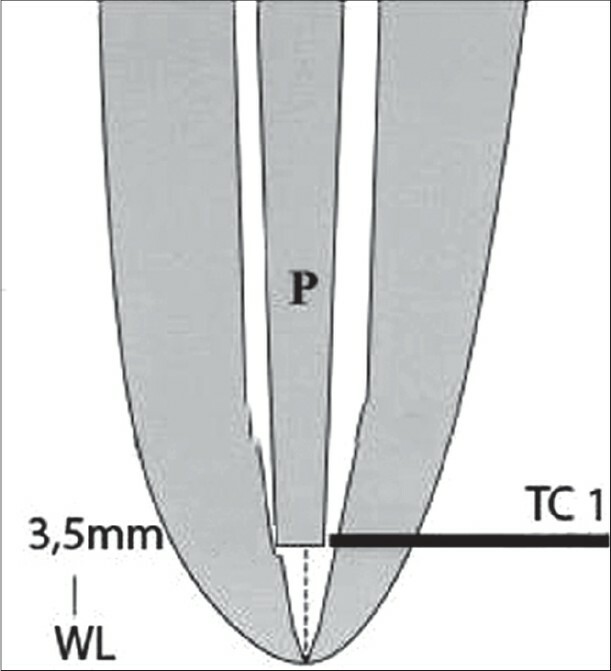 Diemer F, Sinan A, Calas P. Penetration depth of warm vertical Gutta-Percha pluggers: Impact of apical preparation. J Endod 2006;32:123-6. 13. Pagavino G, Giachetti L, Nieri M, Giuliani V, Scaminaci Russo D. The percentage of gutta-percha-filled area in simulated curved canals when filled using Endo Twinn, a new heat device source. Int Endod J 2006;8:610-5. 14. Budd CS, Weller RN, Kulild JC. A comparison of thermoplasticized injectable gutta-percha obturation techniques. J Endod 1991;17:260-4. 15. Bowman CJ, Baumgartner JC. Gutta-percha obturation of lateral grooves and depressions. J Endod 2002;28:220-3. 16. Villegas JC, Yoshioka T, Kobayashi CH, Suda H. Intracanal temperature rise evaluation during the usage of the System B: Replication of intracanal anatomy. Int Endod J 2005;38:218-22. 17. Gharai SR, Thorpe JR, Strother JM, McClanahan SB. Comparison of generated forces and apical microleakage using nickel-titanium and stainless steel finger spreaders in curved canals. J Endod 2005;3:198-200. 18. Venturi M, Pasquantonio G, Falconi M, Breschi L. Temperature change within gutta-percha induced by the System-B Heat Source. Int Endod J 2002;9:740-6. 19. Eriksson AR, Albrektsson T. Temperature threshold levels for heat induced bone tissue injury: A vital-microscopy study in the rabbit. J Prosthet Dent 1983;50:101-7. 20. Hardie EM. Heat transmission to the outer surface of the tooth during the thermomechanical compaction technique of root canal obturation. Int Endod J 1986;19:73-7. 21. Gutmann JL, Creel DC, Bowles WH. Evaluation of heat transfer during root canal obturation with thermoplasticized gutta-percha. Part I. In vitro heat levels during extrusion. J Endod 1987;8:378-83. 22. Gutmann JL, Rakusin H, Powe R, Bowles WH. Evaluation of heat transfer during root canal obturation with thermoplasticized gutta-percha. Part II. In vivo response to heat levels generated. J Endod 1987;13:441-8. 23. Saunders EM. In vivo findings associated with heat generation during thermomechanical compaction of guttapercha. Part II. Histological response to temperature elevation on the external surface of the root. Int Endod J 1990;23:268-74. 24. Weller RN, Koch KA. In vitro radicular temperature produced by injectable-thermoplasticized gutta-percha. Int Endod J 1995;28:86-90. 25. Fors U, Jonasson E, Bergquist A, Berg JO. Measurements of the root surface temperature during thermo-mechanical root canal filling in vitro. Int Endod J 1985;18:199-202. 26. Goodman A, Schilder H, AldrichW. The thermo-mechanical properties of gutta-percha. Part IV. A thermal profile of the warm gutta-percha packing procedure. Oral Surg 1981;51:544-51. 27. Jurcak JJ, Weller N, Kulid JC, Donley DL. In vitro intracanal temperature produced during warm lateral condensation of gutta-percha. J Endod 1992;18:1-3.